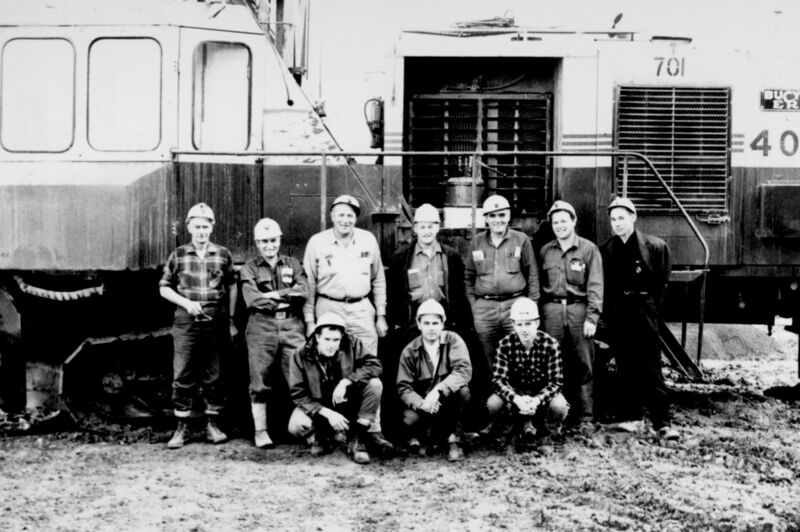 Photograph depicts group of ten men standing and kneeling in front of BE 40R blasthole drill in mine area. For names of individuals, see similar image, item 2000.1.1.3.19.72. Item is one of 45 photographs taken in 1965. Photos have been rehoused, arrangement imposed by archivist with regard to handwritten numerical series on recto. Item is part of the Cassiar Asbestos Corporation Ltd. fonds. Image is one of 45, see items 2000.1.1.3.19.33 - 2000.1.1.3.19.77. See also item 2000.1.1.3.19.72 for image featuring similar content. Handwritten annotation on recto of photograph: "-4". Original accession no. : 2000.1.0685.029 [this photograph came from box 685].